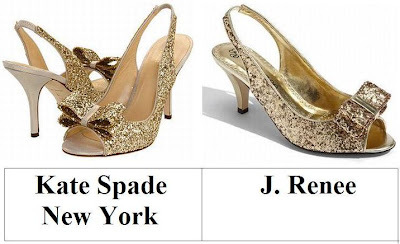 Mon doux, to the left feast your eyes upon Kate Spade New York’s ultra-covetable Charm Heel in Platinum Glitter/Gold Liquid; to the right take a gander at J. Renee’s ravishing Rosina in Gold Glitter Fabric. While the Rosina dazzlers sport a slightly lower heel (2 ½”) than that of Kate Spade’s chic Charm (3 ½”); for a mere $79.95, in comparison to the $325.00 needed to add Spade’s sparklers to your shoe collection, they are every bit as capable of causing a shimmering stir with your many admirers – at a price that allows one to scoop up all three haute hues (Gold Glitter Fabric, Multi Glitter Fabric, and Silver Glitter Fabric)! I actually like the kitten heel of the Renee shoe better. It looks more classy. Oooo, I like the lower heel and price of the J. Renee shoe. Beautiful shoes. Great to see them at that price, too. Lovely! Great lower price too. So adorable. Great cheaper find too. these look like princess shoes! i think i like the kate's better because the heels is a bit taller! They both look amazing! Love heels ^_^ though I can't walk properly in them. WOW.. i can't even tell the difference btw them. The Kate Spade ones are just so charming! Gotta go with the Kate Spades for the higher heel! I love bows.... Somehow I like the higher heels even though I know lower heels are more comfortable. omg i SO want those shoes for a wedding i am going to- thanks for finding!! $80 - that's awesome. These shoes are charming, gold is always beautiful. They are so pretty and sparkly. Thank you doll! You helped us a lot! Oh wow, they're so pretty and glittery. I'm not a huge fan of low heels, so will be picking the Kate Spade ones. splurge... the kate spade ones are to die for!!! I wouldn't mind sparkling at the lower price. I love the bow on the Kate Spade shoes. They're just fabulous. Oh boy oh boy oh boy oh boy. These are adorable, and JUST in time for the Australian summer! I prefer the Kate Spade heel, but I suspect my bank balance will steer me elsewhere. I can't resist the heel on Kate Spade's shoes. I'll take those please! FOR REALZZZ??? This is an EPIC find. I am obsessed with Kate Spade EVERYTHING -- but alas I could never afford it. I LOVE these shoes and i LOVE the lower heel! What a deal! Those shoes are so cute! you always find the greatest shoes at such low prices! gotta LOVE you for doing that! been looking for this kind of shoes as well. Omigod. I've been wanting those Charm shoes since forever. This is an AMAZING find! fab shoes. i like the higher heel of the kate spades. Foot comfort is so important. I'd be willing to be more if I could feel a real difference.